HI! It's been a long time since we've added new materials to our damp proofing blog but over the last few years there have been advances we really needed to talk about but haven't had the time with the usual pressure of work! So much for my day off... but hopefully it will be worth it if it helps people solve damp problems in their homes and, with any luck, that will lead to business for Conifer too and we can all help each other so here goes! We've been installers of membrane damp proofing across the Shrewsbury, Welshpool, Wrexham, Clwyd, Powys, Gwynedd, Aberystwyth, Ceredigion, Mid Wales and North Wales, Chester, Cheshire, Telford, Oswestry and Shropshire areas for many, many years now; gone grey doing it! Or bald, depending on which of the company directors you talk to :o) We added Drybase Flex Membrane damp proofing to our bag-of-tricks a couple of years or so ago (2015) and it is ideal for certain situations with damp brick walls, or damp stone walls if they are fairly neat. As you can see from the, rather deadly, 'before and after' shot at the top of the page, it's pretty effective for contaminated walls! That job was plastered directly on to the membrane and it made for a very tidy application! It is also very useful for damp proofing to concrete slabs as a DPM (damp proof membrane). The main advantage that it has over loose-laid membranes is that it is very firmly glued in place with Drybase Flex Adhesive. This gives us or any home-owner or builder a lot more options in terms of possible floor finishes! Once laid on concrete floor it can be tiled, carpeted, boarded, laminated or otherwise covered with practically any floor finish. However, please note that if carpet is to be used we always insist on the grippers being glued down and not nailed through the membrane! That may sound blindingly obvious but it happens! The picture opposite, if you'll forgive the appalling photography, actually shows a neat DPM (damp proof membrane) job using the Drybase Flex Membrane. 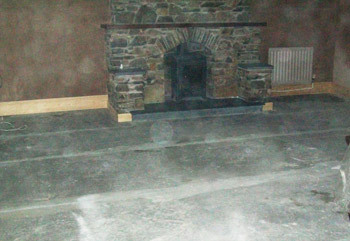 The whole floor of this lounge in an old stone cottage in Aberdovey (Aberdyfi), Mid Wales was a concrete slab suffering with a lot of penetrating dampness more so from the walls than from underneath. The Drybase DPM completely solved the problem and created a nice up-lap for connection to the Oldroyd Xp Plaster Membrane on the walls. The walls were then plasterboarded using the 'dot and dab' method and plaster skimmed as you see from the picture. The walls were showing severe rising damp water marks but the plaster itself was structurally very strong. The Oldroyd went straight over the old plaster and saved a lot of mess as well as creating two cavities (one created by the cavity drain membrane itself and another by the drywall adhesive fixing the plasterboards) to reduce heat loss and cold-bridging. Win-Win for the customer! 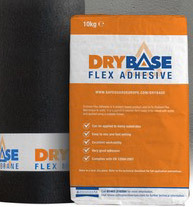 Drybase Flex Membrane is a highly durable and flexible damp proofing membrane for direct application to walls that have been affected by dampness and salt contamination. The flexible nature of the membrane can also make it the ideal choice for walls where retaining some of the 'roll and shape' in the wall is desirable due to the character and age of the building. The fleece lined membrane can be applied to walls using the the same specially formulated Drybase Flex Adhesive used for brick wall fixing. The great advantage with this type of membrane damp proofing system when used on walls is that it can be plastered onto directly, creating a versatile solution to the problem of damp walls when it is not possible to stop the damp at its source. This can be especially useful where a cavity drain membrane such as Oldroyd Xp Plaster Membrane is not practical due to drainage or substrate issues. Drybase Flex Adhesive is a polymer modified cement-based product. We have found that the adhesive is an excellent waterproofer in its own right and when the completely impervious membrane is added to the system it gives a protective barrier you can have confidence in. For more information visit our Drybase Flex Membrane damp proofing page.